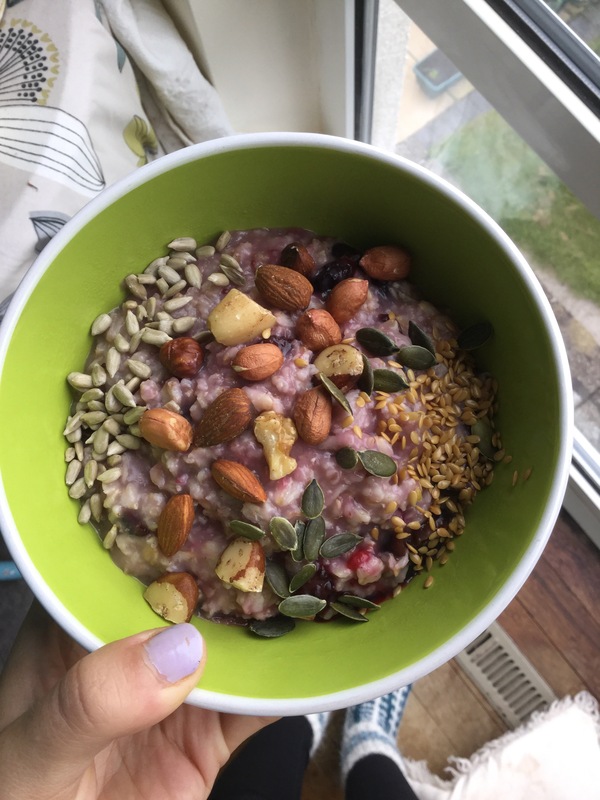 I do the same thing every time I make porridge; put oats in a pan (usually with raisins or dried cranberries) and pour boiling water over. Leave to soak for about 10 minutes. Then turn the heat on under the pan and let the water boil, sometimes a little bit more water might be needed. Then I add the other ingriedients and let it cook for about 2 minutes then serve. Super simple, quick and delicious. There are so many different things you can use in it. I usually mash a banana or frozen berries and put them in as I leave the oats to soak; it makes it sweet and there’s no need to put syrup or sugar in. I like adding peanut butter as well. If we have fresh fruit like strawberries or blueberries I add them in towards the end. Depending on what fruit I use in it I sometimes add cinnamon which gives it a lovely warm flavour. For the toppings I use a variety of nuts and seeds– Brazil nuts, almonds, walnuts, sunflower seeds, linseed, pumpkin seeds etc. For this I cooked apple first and puréed it then followed the usual method of soaking to oats etc but with the apple mixture included. 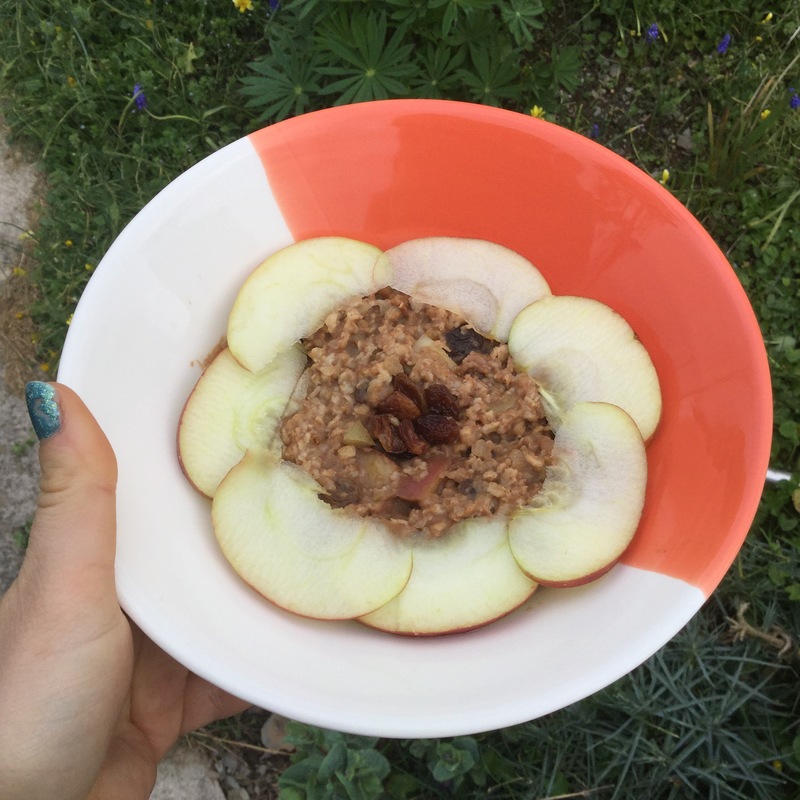 I added cinnamon and nutmeg to give it the apple piey flavour, topped it with raisins and sliced apple. For the ‘carrot cake’ one I made it slightly different by baking it. 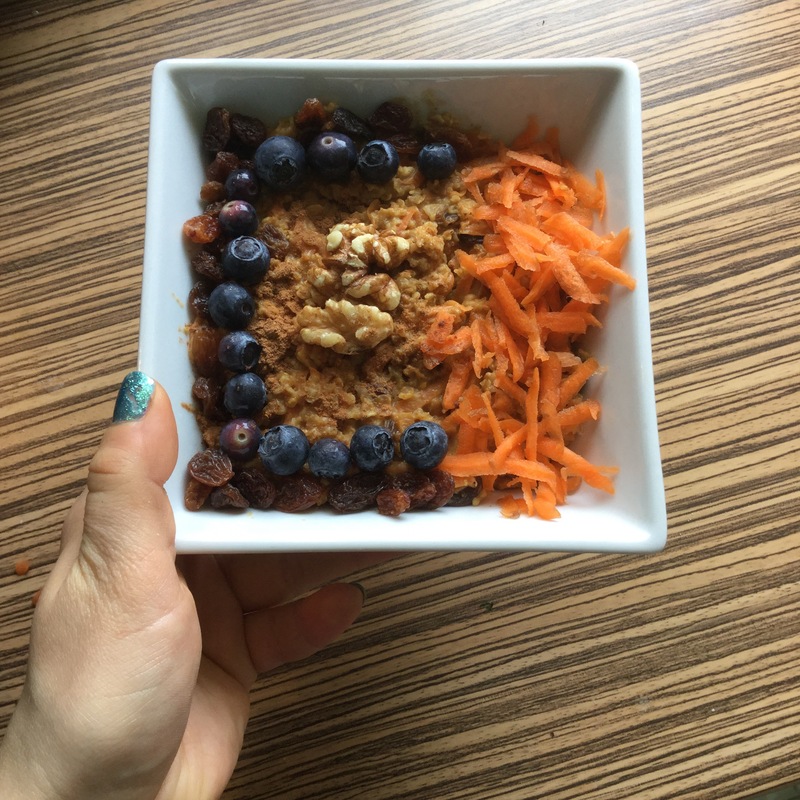 I mixed oats, raisins, cinnamon and a bit of grated fresh ginger together then added in grated carrot and almond milk. Once combined I put them in a preheated oven at 180 and cooked for 30 minutes. When that was done I sprinkled a bit more cinnamon on and topped it with more grated carrot, raisins, walnuts and blueberries. Wow the cinnamon and nutmeg good choice with the carrots. Welcome to this wonderful infinite world Mother Nature brings us! All three recipes look delicious! I like your technique of soaking the oats in juice .